NEW SONG: "Boston Boom Bringer"
This came about when I wanted to make a song featuring one of the Scout's Boombox taunt beats, and The Standell's "Dirty Water". Like an Ubercharged Heavy I'm clearin' out the whole room. Cause every beat I drop is a home freakin' run. So, after 5+ years of weekly DLC, Rock Band is finally putting all o' that to a close. Even though I didn't buy every week, it was still nice to see what they got, and what was coming out every week. Everyone's already said their piece about their own Rock Band experiences,so I'ma skip all that. But really, between this and moving, my quarter life crisis and the new console generation coming, it's a lot of scary change happening at once. Now, the last week is going to be an "fitting ending song" and the top 3 predictions seem to be "American Pie" by Don McLean, "The End" by The Doors, and "Closing Time" by Semisonic. First off, tell me this wouldn't be awesome on all instruments. The drums are fast, the guitar ramps up as the songs progresses, the bassline is strong, if a little repetitive, and the keyboard pattern can change between the chord-based rhythm and the synth lead to keep it interesting. It's got a bittersweet feeling to it, and it was the last song at LCD Soundsystem's farewell concert, so it could be fitting. 2. "Super Rad" by The Aquabats! "And if we die, before the battle's through... Tell your Mom, tell your Dad we were super rad!" I just want some goddamn Aquabats in my game before it kicks the bucket for good. "Rock Band has rocked for a long, long time..."
It's not that long or that difficult, but in a sense it fits. The rocking is over, but Harmonix, through it's Pro Guitar/Keys/Bass/Drums, has taught the secrets that others have learned. Their sauce has mixed with ours, and it has created a goulash known as the Rock Band Network. It's got a big rock ending, strong 6/8 rhythm section and a wicked solo to boot. Dear Harmonix, I will change all the lyrics to reflect the last DLC. Just hook a brother up. For reals. 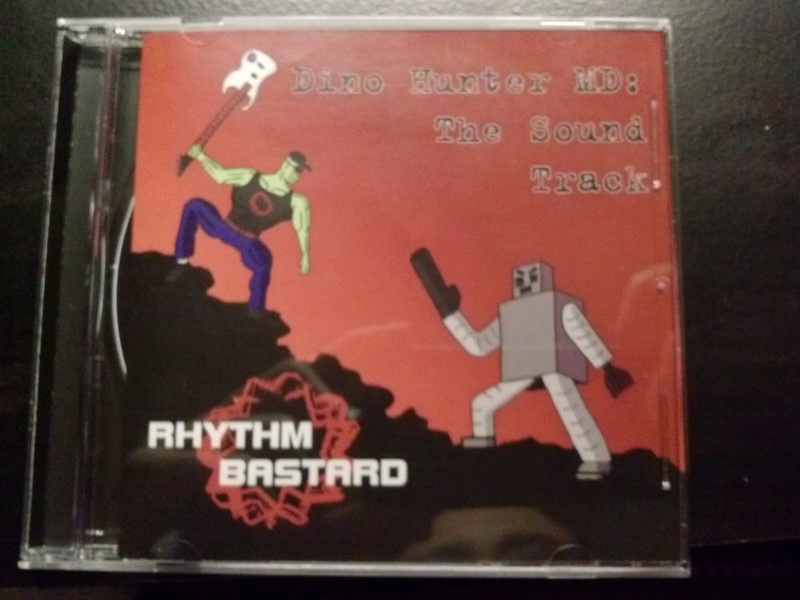 Dino Hunter MD: The Sound Track Now Available On Amazon! The proofs came in the other day, and now you can have a copy to actually hold in your hands! Like, seriously! ALSO, it made it to the front page of Nerdcore Now! ALSO, "Pass The Class" and "Robotman's Lament", along with "Hell Yeah" are in playtesting for the Rock Band Network. I've been posting up random stuff on Tumblr, so if yoou want to hang there, go right ahead! What should you do to this Episode? Pick it up, pick it up, pick it up! -Last names discussion. When Jeff mentioned Webster, my mind went straight to Charlotte's Webb, and I thought that if Jeff DID name his kid Charlotte, then there would be a spider in corner making a web that spelled out "Some Kid". Or maybe, "Should Have Worn Protection"
-Here's the website I used for the trivia questions. I'm partially colorblind, and the red and green answers on the yellow background threw me off, so there are a couple parts where I had to take a couple seconds to get it. Next time. Next time I'll be ready. -LOTTA MY CHEMICAL ROMANCE DISCUSSION. For me, the major turning point was their cover of "Desolation Row" for The Watchmen soundtrack. It's what confirmed them as "punk" for me, or at least close enough. Plus the music video is pretty kickin'. Speaking of which, I've heard all of Conventional Weapons and want them to take my money. Probably before the shitstorm that was Make Believe, “Keep Fishin’”, off of the album Maladroit, was probably the last decent album before that drop off. While a strong blues rhythm and excellent harmonies straight from the 50’s make this fun to listen to, the real reason I’m posting this is because these lucky bastards got to work with The Muppets, even before the big revival from 2011’s movie. These are exactly the kind of shenanigans from the original Muppet Show, and it just be the last time the band was having any fun before the “Let’s take ourselves seriously, but ironically” attitude of the last decade, hence why it’s also the last time I saw Rivers Cuomo smile in public too. BONUS LIVE VIDEO: Rivers Cuomo covering "Brain Stew" by Green Day A relic from said latter era that encompasses modern day Weezer: Doing the 90's as ridiculously deadpan as possibly. Nobody knows what to make of it, but hey, remember when people loved Green Day?